Loving this kids’ travel guide to San Francisco that ZigZag City Guides sent us. 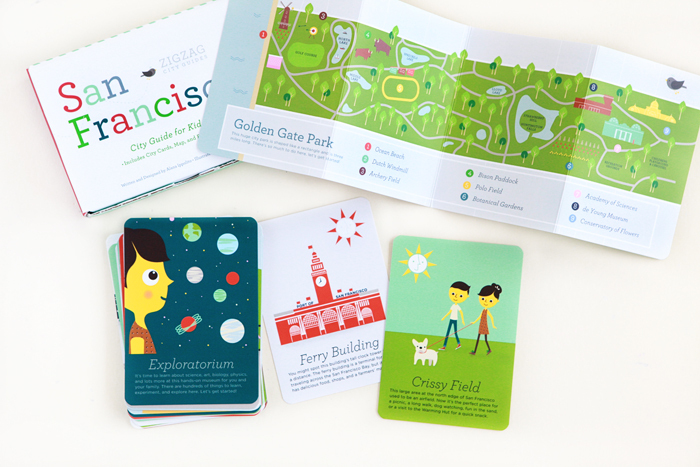 In addition to SF, they have travel guides to NYC, London, Paris and Rome, which include 30 cards with interactive elements, a map and two postcards. Guides to LA, Chicago and Boston are in the works and can be pre-ordered on Kickstarter. “ZigZag City Guides began as my graduate thesis project at the Academy of Art University in 2011. During my research, I found plenty of books for parents traveling with children and stories about cities near and far, but had trouble finding anything that was created specifically for children to use on a trip. Children’s publications related to travel were typically focused on keeping them busy with activities that diverted attention from their surroundings, instead of directing their fresh eyes onto what was new around them. I felt there was an opportunity to enhance their involvement in all aspects of travel―from boarding a plane to navigating through a new city to learning to speak another language.